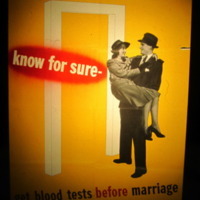 "Know For Sure, Get Blood Tests Before Marriage"
This poster featuring a happy newlywed couple advises people to be tested for syphilis before marriage. 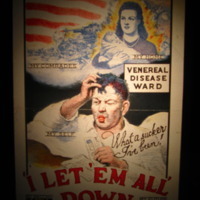 This comic poster warns audiences about the dangers of quack doctors offering fake cures for VD. 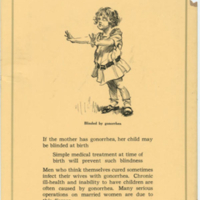 This poster urges men to stay abstinent until marriage, keeping in mind their future wife. 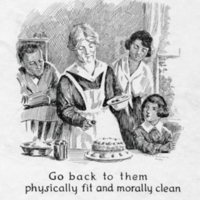 It is part of the "Keeping Fit" poster series. "Somewhere the girl who may become your wife is keeping pure. 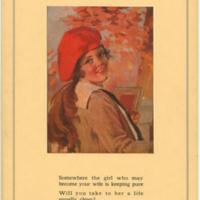 Will you take to her a life equally clean?" 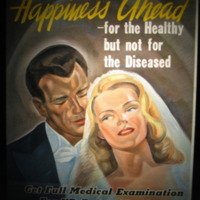 "Happiness Ahead--For the Healthy but Not for the Diseased"
"Get Full Medical Examination For VD Before Marriage"
This poster advises couples to get VD exams before marrying to ensure their happiness. 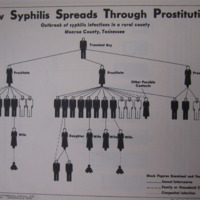 "How Syphilis Spreads Through Prostitution"
"Outbreak of syphilis infections in a rural county : Monroe County, Tennessee"
This is an epidemiological chart that shows how one syphilis epidemic spread. 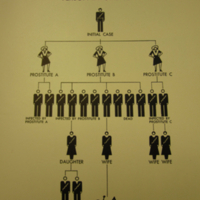 This image was created earlier in the 1930s. Here it appears with a new heading. 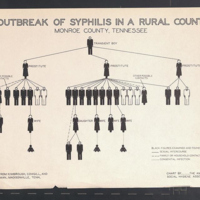 "Outbreak of Syphilis in a Rural County, Monroe County, Tennessee"
This chart shows the spread of syphilis in a rural southern community. 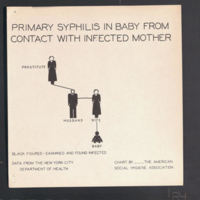 "Primary Syphilis in Baby from Contact with Infected Mother"
This graphic shows how VD is transmitted, eventually resulting in congenital syphilis. 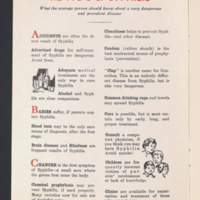 "About SYPHILIS..We know : 1. 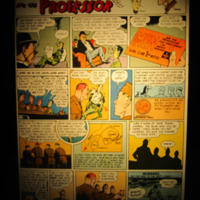 The Cause (Spirochetes) 2. 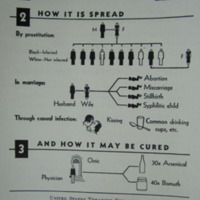 How it is Spread 3. And How it May Be Cured"